One of the great challenges of the 21st century is to bring about global equity without further overstepping the planet’s ecological limits or overusing the earth’s finite resources. Twenty years after the Rio Earth Summit and 40 years after the publication of Meadows’ "Limits to growth", the Heinrich Boell Foundation wants to build on its successful project work on resource and agricultural policy at headquarter and country office level, and launch an international dialogue process on Resource Politics. We will consider various natural resources (such as oil/gas, minerals, land/soil, water, forests, biodiversity), as well as the respective challenges of management and distribution and the search for coherent approaches. The aim is to establish an international framework for fair, coherent and sustainable resource politics at the national, regional and global level. An important milestone in this process will be the Alternative Resource Summit in September 2013. Dealing with the problems and challenges related to resource consumption and distribution, the summit will develop visions and strategies for future action. However, although the summit will be the international highlight, it does not represent the start of the process. In fact, in preparation for the summit we will run national and regional Future Workshops in 2012 and 2013 (please see below for details on the methodology). These workshops will help to identify topics and innovative approaches with regards to resource politics. 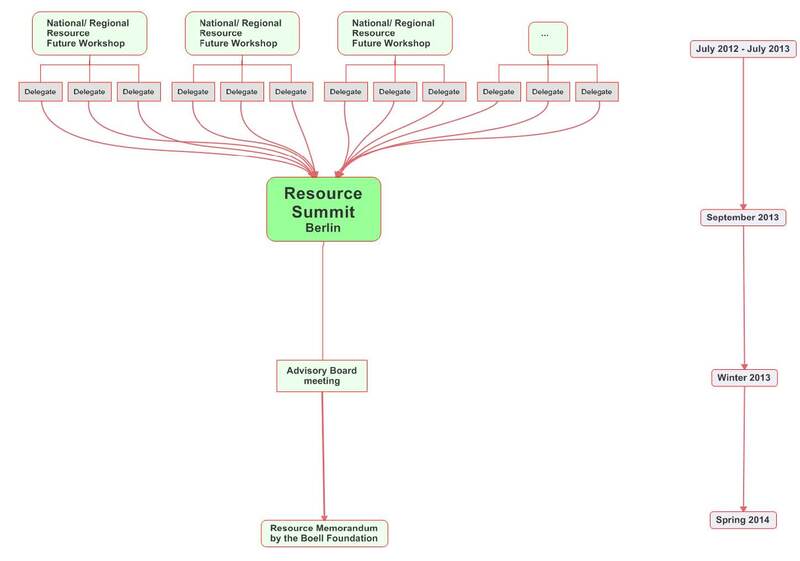 Two to three delegates from each Future Workshop will then be sent to the Alternative Resource Summit in Berlin and the participants of the workshops will be engaging in national follow-up activities with the hbf offices. Follow-up activities on an international level will include one or more meetings of an International Advisory Board with the aim of elaborating and publishing a Resource Memorandum as a milestone for further work on resource politics. …to involve young stakeholders from science and civil society from different regions worldwide and to create new links between regions, actors and approaches and furthermore to jointly develop a new and participative Resource Memorandum. …to make use of the Resource Memorandum in national, regional and international policy negotiations and in discussions with decision makers. …to establish a starting point for activities related to alternative resource politics on the national and regional level together with young actors as a new target group. Both the Alternative Resource Summit and the Future Workshops in general address young people up to the age of 30. These include (graduate) students, young scientists, politically committed persons or job-starters with knowledge about different aspects of the resource topic and an interest in thinking beyond the boundaries of institutions and disciplines. Our economic model and current consumption patterns are highly dependent on the exploitation of limited and often scarce non-renewable energy sources. Investment in the extraction and distribution channels of these resources often have negative impacts on the development prospects of countries rich in natural resources. Looking for new ideas on how to make use of our natural wealth would be the best option. But instead the self-created scarcity often leads to aggressive trade and investment policies and to a shifting of investment to more and more marginal areas and resources (tar sands, arctic, rain forest, deep water, fertile agricultural land etc.). Furthermore, the solutions that are promoted often include technologies which are serving the profit interests of multinational companies (e.g. genetic engineering, bio-fuels, and nuclear power), but which are not coherent and sustainable. Concepts for the substitution of certain scarce resources (e.g. biomass instead of oil, oil/ coal from mineral raw materials such as rare earths, fossil fuels or critical minerals for renewable energy technologies) are also not coherent, creating new problems or enhancing existing ones, respectively. These and many more topics may be addressed in the Future Workshops and the Alternative Resource Summit and are more deeply analyzed in the Essay “To Have or Have Not – Resource Equity in a Finite World”. Future Workshops were originally developed by Robert Jungk in the 1970s. The basic idea is to use creative approaches to find new ways and solutions to problems. This approach enables participants to jointly discuss and generate visions about the future and to find ways to make them happen. the Implementation Phase where concrete steps will be defined on how to implement the visions. In all three phases creative tools (incl. drawings, storytelling etc.) will be used in order to break new ground. This is why we have chosen this methodology. In our case the method will be adapted to our specific topic and the respective cultural background of the countries involved.